Every so often, Australia takes an artist or song to their hearts that not many other countries in the world care for. Toni Childs, Sonia Dada, Andrew Ridgeley... there are countless examples of acts we've turned into chart stars while major territories like the UK and the US remained oblivious to their charms. This week in 1989, a song debuted by an artist who had been successful around the world in the past (and would be again) - but while this new track hit the top 5 in Australia, it missed the mark elsewhere. At number 1 this week in 1989, Madonna made way for Fine Young Cannibals' "She Drives Me Crazy" in the first week of what would become a revolving door at the top of the singles chart. But, more on that later. Released quickly after "Zimbabwe", which was still floundering a few places above, this final single from Union was unable to return Toni Childs to top 50 glory. This was the lead single See The Light, the debut album by the Canadian blues band led by Jeff Healey, who'd lost his sight as an infant. As we'll see, they did a lot better on the albums chart. A few years later, a couple of singles from their second album would almost crack the top 50, but this single from the Sydney indie band's debut album, Shiver, fell further short. Not to be confused with a later medley that also made the top 100 in 1993, this mega mix featured three of the Frank Farian-produced band's hits (five on the 12" version above) and was taken from a remix album. Over the past two weeks, we've seen near misses from Inner City ("Big Fun" and "Good Life"). Next, it was time for another of the UK's hottest dance acts to fall short of the ARIA top 50 with this remake of the classic Burt Bacharach and Hal David composition. Made famous by Dionne Warwick and, shortly after, Aretha Franklin in 1967/68, the track (which was originally intended as a B-side for both artists) has been covered numerous times over the years, but this slowed down reworking was quite a radical change in style for the normally more chirpy tune. Bomb The Bass' version, which dropped the "I" in the song title, was also a change of pace for the dance act. A markedly different release from their previous sample-heavy singles, it featured the vocals of Maureen Walsh, whose biggest solo success was with another cover: an update of Sister Sledge's "Thinking Of You" in 1990. Although Bomb The Bass' Tim Simenon wouldn't find success in the Australian top 50 until late 1994 (with "Bug Powder Dust"), a track he'd had major involvement with was bulleting up the chart this week - Tim co-produced Neneh Cherry's "Buffalo Stance". In 1984, Julian had a pretty successful start to his music career, with a couple of singles from debut album Valotte charting well around the world. But, the son of late Beatle John Lennon didn't live up that early promise with second album The Secret Value Of Daydreaming receiving a critical savaging and flopping on global charts. Julian's third album, Mr Jordan, did just as badly... except in Australia, where it reached the top 20 and yielded this deserved top 5 hit. In this case, at least, Australia got it right. 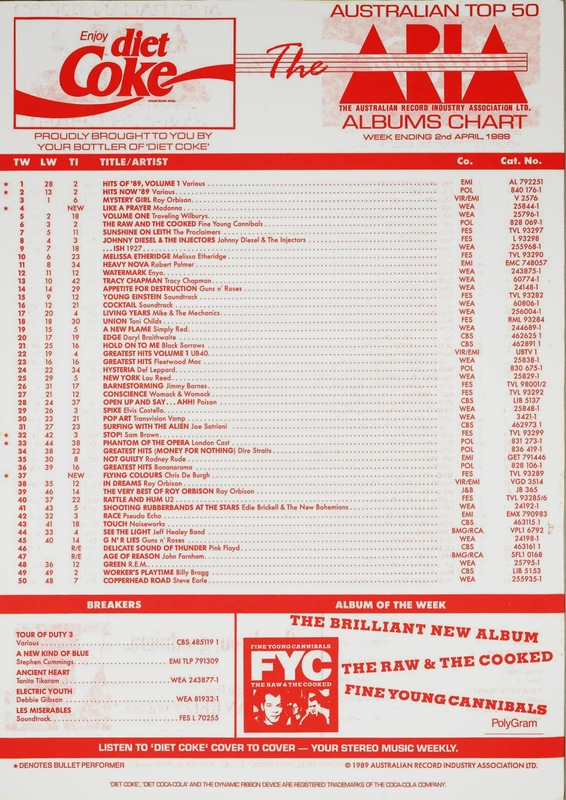 Every time I take a look at the albums chart, it seems there's a various artists compilation or two at the summit of the top 50 - and this week in 1989, two rival albums shot to the top two positions. Hits Of '89 Volume 1 was the more successful of the two (despite Hits Now 89 debuting higher the previous week) and would spend five weeks at number 1, which was hardly surprising given it had five recent top 3 singles on its tracklisting. The best Hits Now 89 could do when it came to massive singles was Enya's "Orinoco Flow". Those two compilations were part of the reason Madonna didn't manage to top the chart - or even reach number 2 - with her fourth studio album, Like A Prayer, which had to settle for a number 4 debut and peak position. 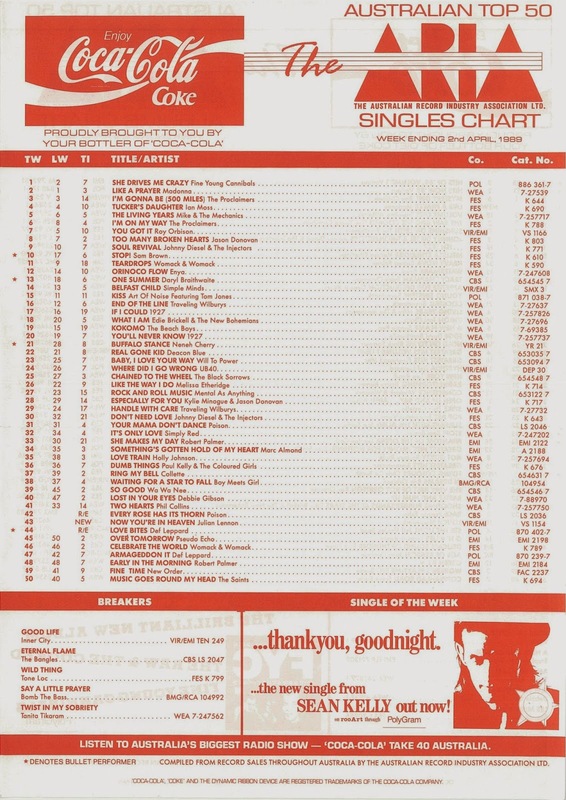 It was chart injustices like this, as well as Kick and Tracy Chapman also being denied a number 1 peak in 1988 thanks to a various artists album, that resulted in compilations (not including soundtracks) being given their own chart in July 1989. 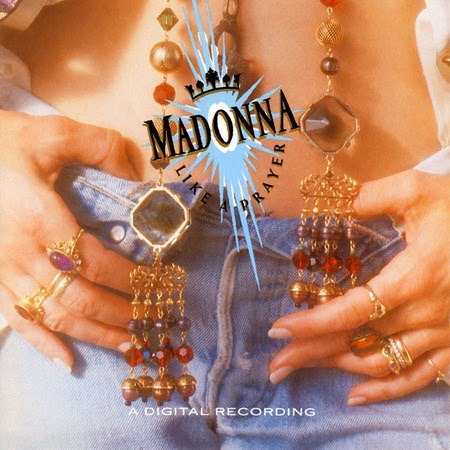 Meanwhile, the arrival of Like A Prayer this week 25 years ago was probably the reason why the title track surrendered the number 1 slot on the singles chart (for the time being) with many record buyers choosing to snap up the full album in its first week of release. Like A Prayer would go on to spend 51 weeks in the top 50, a tally she wouldn't beat until 1998's Ray Of Light. The other reason why Madonna was kept from the top of the albums chart was due to the selling power of The Big O, who was involved in four separate entries on the albums top 50 this week 25 years ago. Roy's studio album (and recent chart-topper), Mystery Girl, and the Traveling Wilburys album took up position either side of Like A Prayer, while a J&B greatest hits collection, The Very Best Of Roy Orbison, popped back in to the top 40, one place below 1963's In Dreams. Most of the albums in the top 50 had yielded hit singles, but that wasn't the case with a handful of LPs by male artists that featured on the chart. 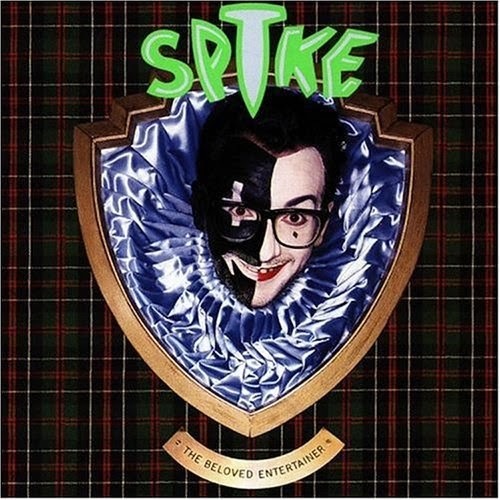 Spike by Elvis Costello and Lou Reed's New York would see their lead singles eventually find their way onto the ARIA singles chart, while albums by Billy Bragg and the aforementioned Jeff Healey Band didn't end up producing a top 50 hit - although the latter did include the original version of "Angel Eyes", a future chart-topper for Paulini. Next week: the singles chart roars back into action with seven new entries, including a future number 1 and the first of two songs with the same name to enter the top 50 within a fortnight. Plus, gold and platinum accreditations make their first appearance. I remember reading about the Bomb the Bass track in UK 'Number One' magazine, but didn't actually hear it until buying the 'Hits Now '89 Volume 2' cassette a few months later. Shame it didn't crack the top 50. How strange that 'Love Bites' re-entered this week *with a bullet* (which probably means it climbed about 20 places at that region of the charts)! Maybe there were 'distribution problems' last week? 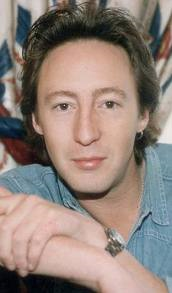 I remember seeing the Julian Lennon video on 'C'mon Kids', when they used to sometimes play a random music video. I forgot (or didn't notice) that Diet Coke sponsored the albums chart side of things. Maybe full-sugar Coke was what the 'kids' wanted (just like the singles chart), while the artificially-sweetened Diet Coke was marketed more towards the more 'health' (?) conscious adult market... just like the albums chart (sans compilations). I opted for 'Hits Now '89' out of the two compilations, as it had more tracks I wanted. I *did* want 'Buffalo Stance' from 'Hits of '89 Volume 1', but didn't have enough pocket money to get both. It was still a few weeks before I discovered cassingles, so I had to go without 'Buffalo Stance' altogether. I too purchased 'Hits Now '89' over its rival. Probably because they were lesser known hits and not flogged to death. I actually didn't mind the compilation albums being listed on the album charts. Being a compilation junkie of the 80's I liked seeing that the No.1 album was a compilation, but yeah, the artists did get ripped off by it, by not hitting No.1.